Our time on the East coast was spent in Cairns and at the small holiday/marina town of Port Douglas about 75 minutes north. We arrived in Cairns and transferred to the Bay View hotel, our home for 4 nights, the hotel had a tropical feel with lush gardens and two courtyards filled with palm trees and tropical shrubs. It also had an award-winning Balinese restaurant voted best speciality restaurant in Australia in 2015, we made a mental note to investigate during our stay. On our first day we were booked on a trip to visit the Great Barrier Reef and go snorkelling, the bus picked us up at 08.40 and drove us to… Port Douglas where the boat left from the wharf; still at least we got a preview of what to expect a few days later when we were due to transfer to a hotel in Port Douglas!! Any way we boarded the Quicksilver 8 a modern catamaran which would take us out to a dedicated dive platform on the reef. The trip took about 90 minutes during which coffee and cakes were served and a film was shown telling us what to expect when we reached Agincourt Reef. The trip out was very comfortable and dead calm. When we reached the platform we were very impressed, it had lots of undercover seating, showers and changing rooms, a large cafeteria style buffet area and lots of platforms giving easy access to the water. Unfortunately, this time of year is Stinger season; stingers are small transparent jellyfish with a nasty sting that can be fatal. On the advice of the ship’s crew we hired ‘stinger suits’ lycra all in one suits with built in hoods and mittens, the suits protect you from the stingers and make it safe to swim. No, we didn’t take any pictures, you will just have to use your imaginations! Fully kitted out in our stinger suits and with masks, snorkels and flippers we headed in to the water. We had both been looking forward to this trip and were expecting bright coloured fish, anemones and coral. We did see lots of fish, including some very big ones (sorry can’t be more specific) which are attracted to the platform where they are fed twice a day. The reef itself was a bit disappointing, maybe our expectations were too high, and maybe the reefs we swam on in Samoa and Fiji have spoilt us but the Great Barrier Reef was quite grey and dull, no plants or anemones and a lot of the coral looked past its best. Some areas of the reef are suffering from the effects of climate change, we did wonder if they are directing tourists to already damaged areas in order to protect other parts of the reef. All that said we enjoyed the dive and there were plenty of fish to see so it was a good experience and very professionally organised. When we had finished our swim we returned to the platform and enjoyed a buffet lunch. The boat back to Port Douglas left at 15.00, and got us back to shore in time for our bus back to Cairns. 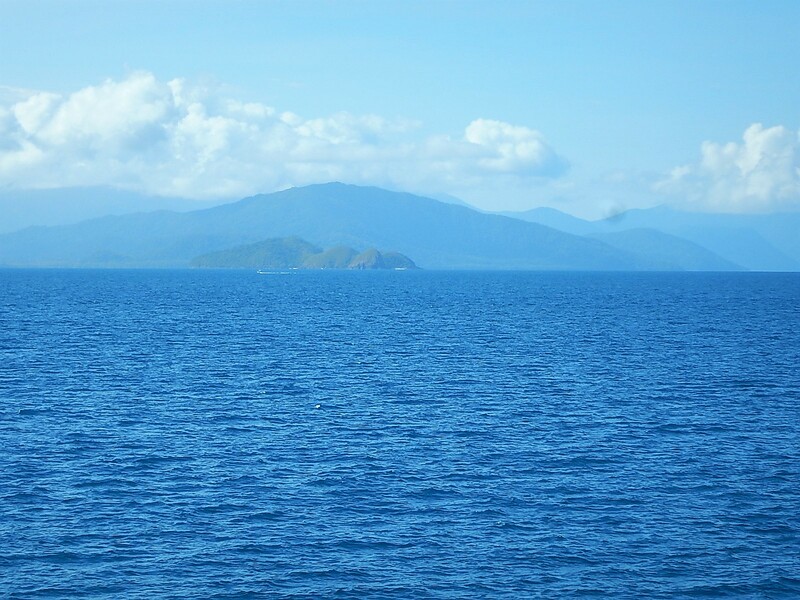 It was lovely being at sea along the North Queensland coast, this is the only place in the world where two world heritage sites meet, the Tropical Rainforest (known as the Wet Tropics), and the Great Barrier Reef the view back to the coastline was spectacular. All in all, another good day. 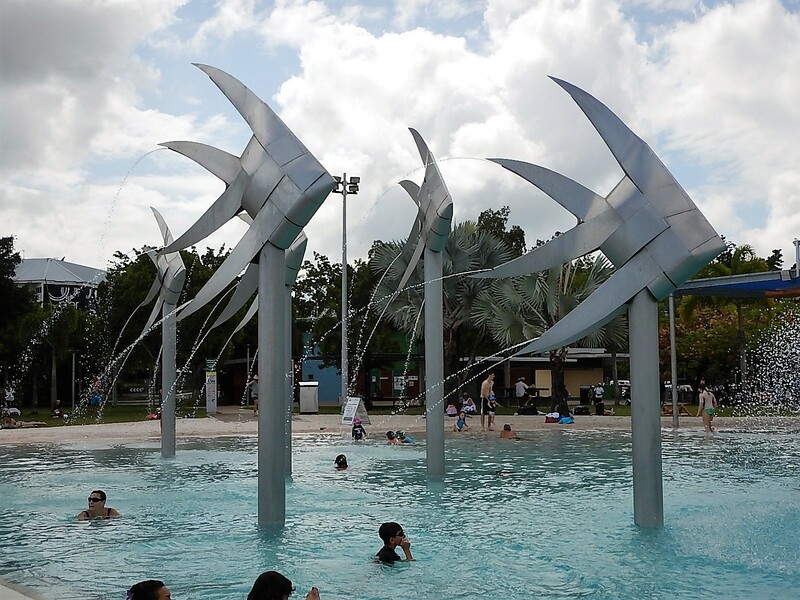 The next day, Saturday, was free so we took a chance to explore Cairns, it was very hot so we took it steady – we have developed a tropical walking pace – and walked along the water front and into the centre of town. There is a large public pool on the Esplanade and it was full of people enjoying an aquacise class to music. The woman leading the class was wearing a bikini and a Santa hat and the music was Christmas pop songs. It is a small town and is geared to the backpacker market but there is a nice new shopping centre with excellent air-conditioning and we whiled away and hour in there cooling down. That night we had a table booked in the Bay Tree Balinese restaurant, we decided to order the Reistafel a four-course sample menu including lots of small dishes of food served with steamed rice. It was really good. First course was a selection of chicken, beef and seafood sate sticks served with salad and peanut sauce. Then we had chicken and sweet potato soup, followed by rice with 5 different curry style dishes with another salad and pickled vegetables. Desert was a selection of sweet cakes, black rice pudding and fresh fruit. It was excellent and certainly whetted our appetite for our visit to Bali next month. We had another excursion booked on Sunday, a trip on the historic Karunda Railway which was built in the 1870’s to open up access to the goldfields further north. We caught the train from Freshwater Station just north of the city and enjoyed an amazing 90- minute ride up through the rainforest to the little town of Karunda. The track wound around gorges, crossed dozens of trestle bridges, ran through over 50 tunnels and climbed and climbed. I have no idea how they built it but it was a wonderful trip, we hadn’t quite anticipated what the journey would be like so it was a great surprise. We spent a couple of hour exploring the little town of Karunda which is essentially a tourist attraction with café’s galleries, souvenir shops and market stalls. We did drop in to the Australian Butterfly Centre which was very interesting, we got to visit the labs where the breed native butterflies, some of the species are as big as your hand and very brightly coloured. We had lunch on the veranda of the Karunda hotel looking out over the rain forest and then reported for our journey back to Cairns. The return trip was via the world’s longest cable car, it runs 7km from Karunda over the rain forest canopy (only a few feet clear most of the way) and back to the coastal plain near Cairns. From Karunda we followed the course of the river passing over the gorge, a waterfall and a hydroelectric station then travelled up to the highest point in this range of hills. There was a station at the top with a boardwalk that loops through the forest providing a 20-minute walk, we jumped off and discovered a forest warden waiting to lead a guided walk, nobody else showed up so once again we had a private guided tour. We learned a lot about how plants co-exist in the rain forest and the lengths they go to to establish themselves and to reach the light at the top of the canopy, Fascinating. After the walk, we re-joined the cable car for the journey back to the base station and the coach home. On Monday we got a lift back to Port Douglas where we were looking forward to a couple of days doing not much. The Martinique Apartments were lovely, a small hotel run by a very friendly Dutch couple. We had a one bedroom apartment and use of a pretty pool in a courtyard surrounded by shady palm trees. We also had a good internet connection and were able to arrange a video call to my Mum and my brother in Highcliffe which was a treat. Port Douglas is famous for its beautiful Four Mile Beach, an idyllic stretch of white sand and palm trees. We walked down to see it and it looked perfect however it also has salt water crocodiles and stingers, the council has erected a stinger net around an area about the size of a swimming pool which is safe to swim in (allegedly) however on balance we decided to use the pool at the hotel instead. We enjoyed a couple of lazy days pottering around Port Douglas. We went down to the wharf and visited a microbrewery where Mark felt duty bound to try the sample paddle of 6 beers served in 4oz glasses. As we were in an apartment we decided to pick up some bits for picnic dinners for the two nights we were there and have a break from restaurants, on the first night we had French bread, prawns, guacamole, and fresh mangos, as we have said before, it is a tough life. We did look for little blue plaques but none seen, you must be more noticeable next time! We did enjoy ourselves!